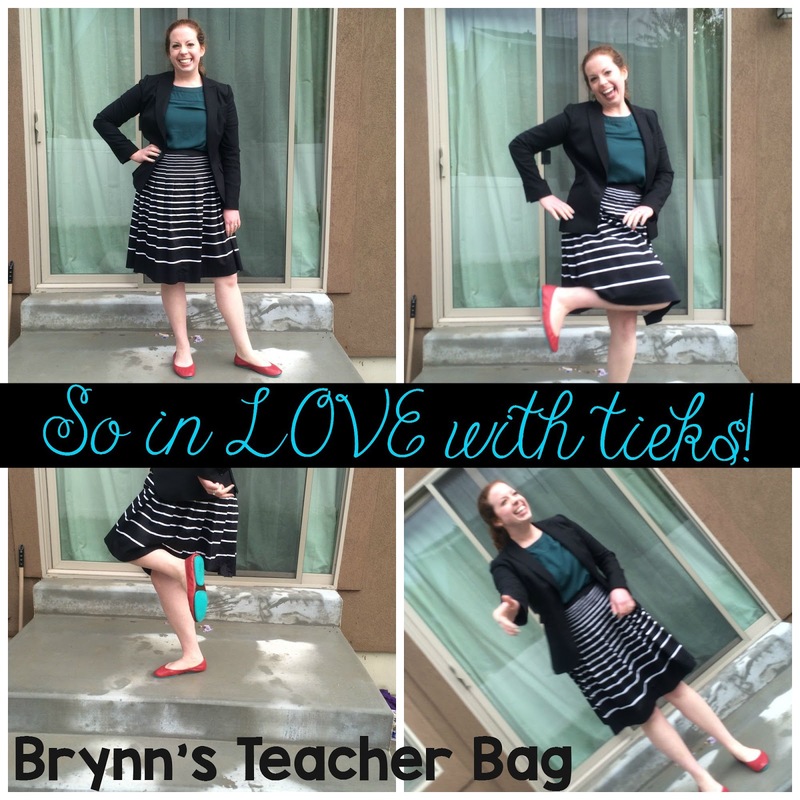 Brynn's Teacher Bag: This teacher LOVES tieks! At the beginning of every school year I start shopping for the most comfortable teacher shoes. This year, instead of going to every store I can think of, I took my question to my teacher friends on facebook. I had many responses, but I am picky about what my "comfortable" shoes look like. I was looking for something cute, comfy, and durable. So, after careful consideration and some research, I decided to try out tieks. Now you're probably thinking, "Are you crazy? That's a lot of money for shoes!" Well, you would be right, but finding shoes that are cute, comfortable, and come in every color imaginable sold me! The first day I wore my tieks to school my feet didn't hurt and neither did my back. I have had back problems from fracturing my tail bone when I was younger, and my arches have fallen too. So I am VERY particular about my comfort level when it comes to shoes. I am also big on having flats that don't make my feet hurt or leave me with back spasms by the end of the day. This has been my experience with many brands in the past, so I was a bit skeptical. I'm ecstatic to say these shoes are like walking on a cloud! Whatever technology went into making the tremendous turquoise bottoms and bendable leather structure, have sold me for life! Not to mention, they come in the prettiest turquoise box with a bag to carry your shoes. 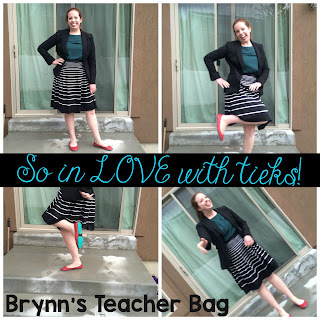 If you are in the market for some new "teacher" shoes, I would suggest taking the plunge, and splurging on a new pair of tieks! You won't be sorry! AND just so you know how much I love this company and their fabulous shoes, I'm giving away a $50 gift card! The giveaway starts tomorrow and ends the following Monday. Enter below for a chance to win! Happy feet make for a happy teacher! Thanks for the review and the periscope! :) It was nice chatting with you. I'd love to own a pair in every color too ... we can be twins one day ... in the distant future. I was just talking about Tieks on my scope earlier tonight!! I keep hearing about them!! My favorite teacher shoe to wear are Toms just because I think they are so comfy! I even like wearing the strap wedges!! Thank you for doing such an awesome giveaway!! Thank for your review. I have been interested in these for awhile now. I bet it is hard to choose a color! 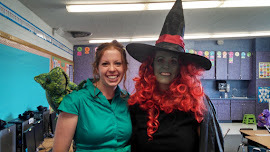 I'm not always on my feet like my amazing teacher friend (you! ), but I always seem to pick out the most uncomfortable ballet flats so these look amazing. I always end up wearing the most ridiculously boring shoes! I have been drooling over Tieks for about a year or so now, but just cannot justify the price tag! I would LOVE to win this giveaway and find out how amazing they really are! I want Tieks so badly. I have heard about them for awhile now, but because I am finishing up my Master's Degree and am student teaching I am having a really hard time justifying spending the money on them. This review just might have convinced me that I should save some money and get a pair. My mentor teacher has a pair and she swears by them as well. I think that I am sold. I really hope to win this give away to help me get my first pair!!!! Thanks for the info!!!!!! I don't have a favorite brand of shoes to teach in. I'm always trying to find a pair. I currently have a pair from American Eagle Outfitters that are really comfortable but are falling apart. I also have a few pairs of Lucky Brand shoes but I've noticed that some pairs are more comfortable than others. I have been DYING to try a pair of Tieks! My current favorite brand to wear are Sperry's, but they don't go with every outfit. I need something cute that goes with a dress!